Well this is now the second Doom level re-creation that MSDN has released. First one is from Dukebert and that level was(and is) called 'DrDoom' (as you can see I wasn't very good in doing reviews then). 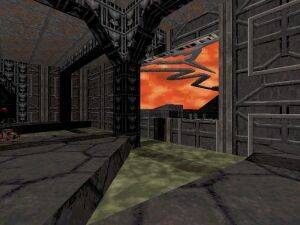 This level is a re-creation of E1L1 in first Doom. Nothing really surprises me in this level. I have seen E1L1 being recreated many times before so this is just another same style level. Design is pretty good. William Gee has released some well designed dukematch levels during past months. So design is more detailed that it has been before in other re-creations but still it could use more details (and I know that William is able to do them). Textures are quite lame. Very small, well designed & fun but still only a simple re-creation of Doom's E1L1 that we have seen many times before.